A critical property for tissue adhesives is a controllable degradation rate so that these adhesives do not act as barriers to wound healing. Typical degradation tests require large amount of samples, which can be tedious and expensive to perform. Additionally, current degradation tests are carried out in vitro under simulated physiological conditions and may not accurately reflect the complex environment that an adhesive would experience in vivo. As a means to develop a simple technique for testing tissue adhesive, a rapidly degrading adhesive hydrogel that mimics mussel adhesive proteins was coated onto magnetoelastic (ME) sensor strips to track the degradation of the adhesive remotely and in real time. Adhesive-coated ME sensors were submerged in phosphate buffer saline solution (pH 7.4) at body temperature (37 °C). Based on the change in the resonant amplitude, the degradation time was determined to be 22 min, which was in agreement with qualitative monitoring of the bulk adhesive hydrogel. Additionally, when the adhesive-coated ME sensor was incubated in a slightly acidic medium (pH 5.7), the degradation rate was drastically lengthened (3 hrs) as the hydrolysis of ester bonds is faster under basic conditions. Oscillatory rheological testing confirmed the formation and degradation of the adhesive. However, rheological test results did not accurately reflect the degradation rate of the adhesive hydrogel, potentially due to a slow exchange of acidic degradation products with the surrounding medium. 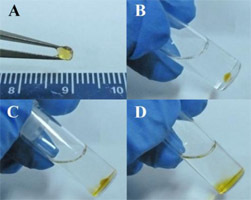 ME sensor was demonstrated as a potential useful tool for evaluating the degradation rate of bioadhesives.